Kid Time Enterprises, LLC: MCVET's Homeless Veteran Stand Down is June 2-3, 2018. 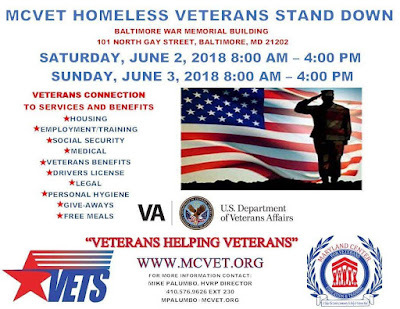 MCVET's Homeless Veteran Stand Down is June 2-3, 2018. Did you know that you can connect homeless veterans to resources in Baltimore on June 2-3? All you have to do is share this information with others who may encounter them. I am proud to be an ambassador for this event. Your help to reach more veterans in need is greatly appreciated.